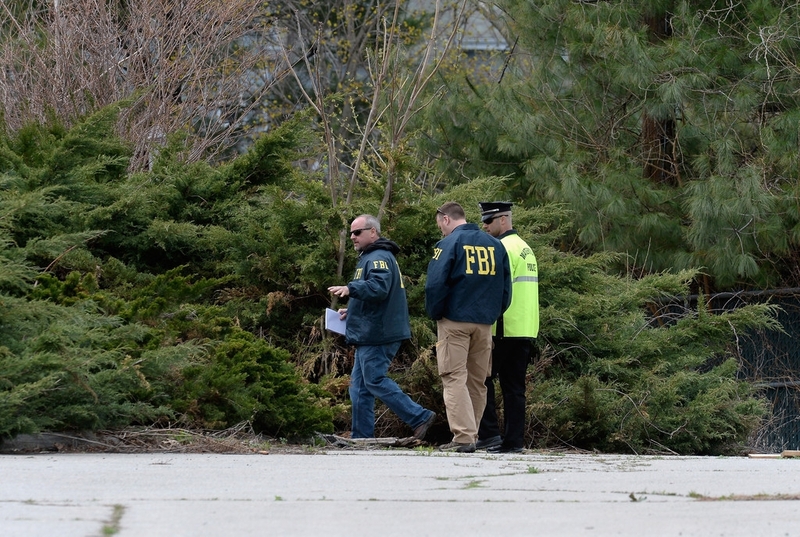 FBI investigators and Watertown Police officer walk in parking lot as they investigate the shooting scene near the boat where bombing suspect was hiding from police on Franklin Street on April 20, 2013 in Watertown, Massachusetts. A manhunt for Dzhokhar A. Tsarnaev, 19, a suspect in the Boston Marathon bombing ended after he was apprehended on a boat parked on a residential property in Watertown, Massachusetts. His brother Tamerlan Tsarnaev, 26, the other suspect, was shot and killed after a car chase and shootout with police. The bombing, on April 15 at the finish line of the marathon, killed three people and wounded at least 170 - high-definition photo for free download.